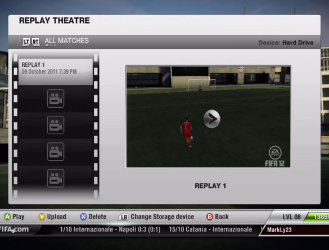 The returning Replay Theater of FIFA 13, which debuted in FIFA 11, organizes your replays into one space, and provides a place to view your saved replays. FIFA 13 automatically saves your highlights of the game such as goals, close misses, shots, etc. This way, after the match you can pick and choose which highlights you would like to save to view or upload later without having to pause during the game to save an instant replay. This also eliminates the old problem of replays in online matches, previously you couldn't pause online games to look at instant replays, so the only way to record online games was through an external capture device. If you are interested in recording better quality FIFA gameplay that can be saved on to your computer for viewing or making goal montages to put online, check out this guide to Capturing your FIFA Gameplay.